Ticonderoga, N.Y. - What activity combines solving puzzles and testing your knowledge of history with fresh air, sunshine, and over two miles of winding trails? Fort Ticonderoga’s Heroic Maze: A Corm Maze Adventure! Beginning August 11, bring the family along to test your navigational skills among towering stalks of corn in Fort Ticonderoga’s six-acre corn maze located near the King’s Garden. The design changes every year, making it the perfect annual family fun activity! The Heroic Corn Maze is included in a Fort Ticonderoga general admission ticket and will be open daily August 11 - August 26 from 10:00 am - 5:00 pm (last entry at 4:30 pm). The maze will be open on weekends only September 1- October 21. It is also open Labor Day (September 3) and Columbus Day (October 8). Call 518-585-2821 to ask about group rates and availability, or visit www.fortticonderoga.org for corn maze details. The maze, with a fun new 2018 design featuring a naval ship to represent the year of 1781, is divided into two phases, giving guests the chance to gain confidence in the smaller maze before tackling the main maze. The average journey will take from twenty minutes for the first phase and up to an hour for the second phase. Hidden in the maze are eight stations, each representing a component of an 18th –century ship. Players are given a Quest Card to collect a stamp from each section. It takes perseverance and skill to find all of the objects. The Heroic Maze is great fun for all ages! Fort Ticonderoga’s youngest guests will have a chance to explore the Heroic Maze in the Kiddie Maze, a short maze designed for our youngest visitors, giving a fun introduction to corn mazes! This maze has twists and turns, but no dead ends. With adult supervision, this maze is recommended for children up to age four. Explore the 6-acre corn maze using your flashlight as a guide and under the light of the full moon and crisp October air! The mysteries of the night surround you as you search for hidden stations in the maze to complete our “Engineer a Fort” Maze Quest! The Maze by Moonlight event takes place on Friday October 26-Saturday October 27, 2018. The cost is $10 per person; tickets are available at the door. Admissions booth/maze opens at 7:00 pm; last ticket sold at 9:00 pm, the maze closes at 10 pm. School field trips and other group tours will have the fun opportunity to learn about Fort Ticonderoga’s dramatic story, while building teamwork skills as part of this interactive, interdisciplinary quest! In September and October, the Heroic Corn Maze will be open for group visits on Thursdays and Fridays from 10:00 am until 2:00 pm. Group tours require advanced registration and can be done by calling Fort Ticonderoga Group Tour Coordinator, Ryann Wiktorko, at (518) 585-1023 or emailing rwiktorko@fort-ticonderoga.org. Fort Ticonderoga developed the Heroic Maze with a professional maze design company from Utah that used computer software to translate intricate designs onto the landscape, creating a fun and exciting quest. The agricultural history at Fort Ticonderoga dates to 1756, when the French built the Garrison Gardens below the walls of the Fort. The agricultural story continues today with nearly 40% of Fort Ticonderoga’s landscape in agricultural use. In addition, a strong horticulture program brings the use of landscape to life in the formal Colonial Revival Garden, working Garrison Garden, and other Discovery Gardens. The Heroic Maze: A Corn Maze Adventure! is funded in part by generous support from McDonalds of Ticonderoga. 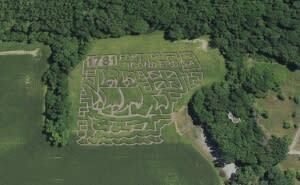 Photo: Fort Ticonderoga’s Heroic Maze: A Corn Maze Adventure! opens on August 11, 2018 with a NEW design!